New Year's Resolutions are in full swing. I never need motivation to workout. Clean my house? Yes. Workout? No. I am fortunate to get to train a few people in the private spa/fitness center at work this time of year. I've been getting in an extra one or two workouts most days. Even with all of the state-of-the-art equipment, I still like body weight and free weight exercises the best. Body weight exercises can be done anywhere with limited to no equipment. If I could only choose 3 pieces of equipment, I'd choose a yoga mat, a pull up bar, and a medicine ball. You can easily make a medicine ball for just a few dollars compared to purchasing one for $30-$40. Step 1: Use an old basketball or deflated (even better) sports ball. 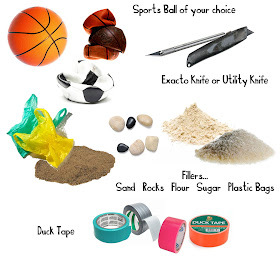 You can also purchase a cheap basketball in the ball bin at a store like Target for around $3. 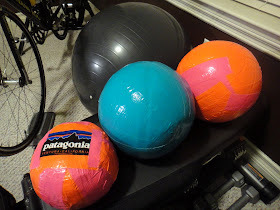 I used a torn up bouncy soccer ball for the small ball and cheap basketballs for the medium size balls. Step 2: Using an Exacto or utility knife, cut a 3-5" slit on the top of the ball. You want to cut it long enough to be able to pour your filler inside the ball. Step 3: Fill the ball with fillers like sand, rocks, sugar and flour. Want around a 5lb ball? Use a 5lb bag of sugar. There will be extra space in your ball. Shove used plastic grocery bags to take up the empty space. Pack the ball as tight as possible. Step 4: Holding the slit together, start duck taping strips of Duck Tape all around the ball. Small pink/orange with Patagonia sticker is 5 pounds using sugar and plastic bags as the filler. Medium blue is 10 pounds using flour and plastic bags as the filler. Medium pink/orange is 20 pounds using rocks, sand, and plastic bags as the filler. The small ball packed tightly. The blue medium size ball has a bit of a divot, but I actually prefer the slight indentation while doing exercises such as push ups with my hands on the ball. Squat with the ball and toss it into the air while you straighten your and catch the ball as you come back down into a squat. Lean back and twist the ball from one side of your body to the other side of your body for a good core/ab workout. There are so many different exercises you can come up with using the medicine ball and a $3-$5 project sure beats a monthly fee at a New Year's resolution crowded gym. wow. Thanks for the post. 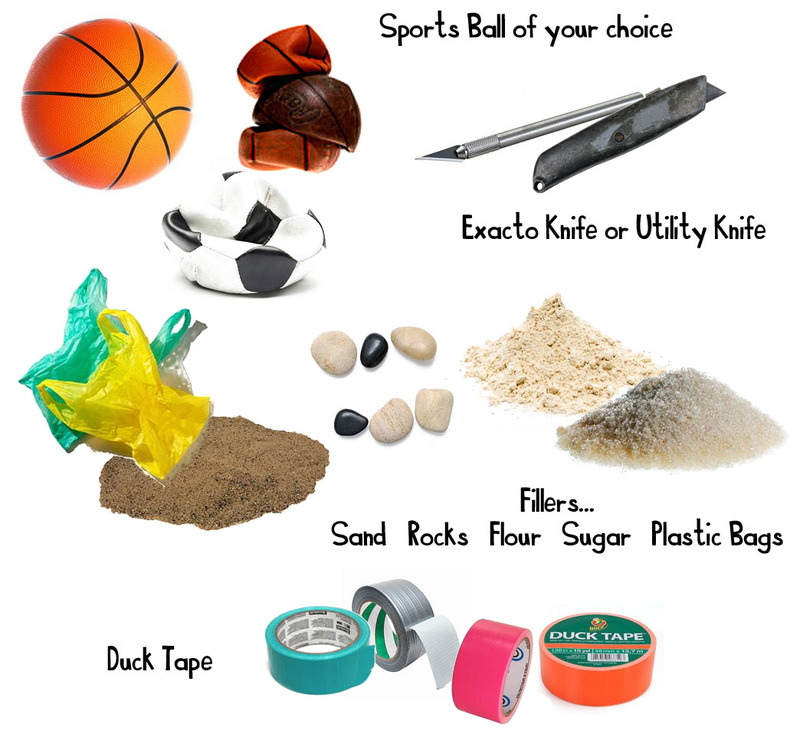 Making a medicine ball yourself is an exiting task and saves money too. waiting for the next post.